Volvo head gasket is a gasket that sits between the engine block and cylinder heads in an internal combustion engine. Its purpose is to seal the cylinders. Think you’ve blown your volvo head gasket? Here are some symptoms. A Volvo head gasket is a gasket that sits between the engine block and cylinder head(s) in an internal combustion engine. Its purpose is to seal the cylinders to ensure maximum compression and avoid leakage of coolant or engine oil into the cylinders; as such, it is the most critical sealing application in any engine, and, as part of the combustion chamber, it shares the same strength requirements as other combustion chamber components. I have a V70 wagon with 183,000 miles – I was driving to the mountains for the day (about 125 miles into 160 mile roadtrip) when I noticed white smoke coming out of the exhaust pipe. I happened to be at an exit ramp when this occurred and immediately jumped off the Interstate. I parked the car, shut it off and checked the oil – sure enough (or so I think)… a blown Volvo head gasket. The oil had turned into a thick mixture, almost like a chocolate shake. Can anyone tell me with some certainty and without actually seeing the car if this in fact is a blown head gasket? What is the likliness that I did major engine damage? The car never overheated, the white smoke was apparent for only 500 feet before I pulled over and shut the car off. I never even had a warning light on the dash. I am hoping the damage is limited to just the Volvo head gasket however my next question: Does anyone know what this type of repair job costs? I just don’t want to walk into the garage tomorrow only to have my bank account drained. You were very very smart to cut the engine off before you started to get over-heating codes. No smoke from the engine bay? How about loss of coolant from the over-flow tank? Is the coolant brown too…like oil is floating in it? These things aren’t mentioned. Usually if you have a bad head gasket, you at least have smoke coming up from under the hood…like a mixture of smoke and steam. 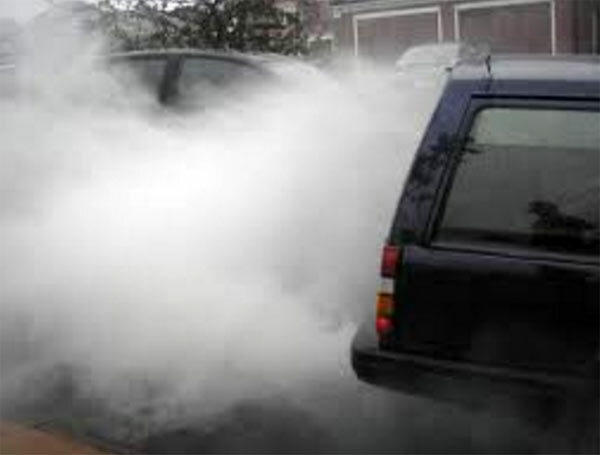 If you do have coolant loss but no smoke from there, then you might have gotten very lucky, but then maybe not. My best guess is (since you didn’t mention smoke from under the hood) that your radiator broke. Our radiators cool the engine by way of coolant and they also cool the oil. A section inside the radiator probably blew and spilled coolant into the oil and thus into your engine. This however often causes a warped head- but then it would leak and you would have smoke under the hood. Just a guess, but very plausable. Get this checked by a good indy mechanic. If you’re double lucky, replacing the radiator along with flushing the coolant and engine may render your Volvo drivable again….but I would keep my fingers crossed on this one. Whatever you do, avoid the dealer…they’ll try to sell you a rebuilt engine most likely, no matter what has happened to your car- several thousand dollars. I hope the best in your situation. Good luck!